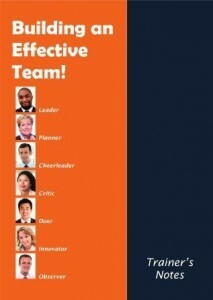 The activity is based on a set of seven team roles that are considered essential components for high-performing teams. In the first stage of the session participants complete a questionnaire to identify their main skills and personal attributes. The Trainer now introduces the list of seven key roles or types and works through each in turn. For each type they first explain what comes naturally to that type of person. They then match their findings to the defined team roles. They identify their preferred team role - or roles. Now participants form teams so that there is a good representation of all the different team roles in each team. A person may of course take on more than one role - although clearly a team of five leaders is going to be problematic! And a person’s preferred roles are not ‘set in stone’. He or she may adopt different roles depending on the particular team dynamics and task. Team members now use a label to identify their roles. In the second stage teams are put to the test. Issued with a Team Brief which describes a tennis tournament teams must work out details of play, costs and entrance fee, design a poster and prepare advertising copy. They have 15 minutes planning time before they are issued some resources (flipchart paper and coloured pens) and then have 20 minutes to complete the task. The task is designed to bring the key team roles into relief and gives participants the opportunity to reflect on their own best skills and attributes - and put them to the test. 1. Explain briefly that the session is going to look at the importance of having a wide range of different roles available in any team endeavour. We all have preferred roles but we can also be flexible. 2. Issue each person with a copy of the Team Roles Questionnaire and allow 5 minutes to fill it in. It enables individuals to identify their preferred role or roles in team situations. Use the PowerPoint (optional) to describe and review the seven key roles. 3. Ask each participant to write their preferred role on a label to stick on their lapel area. Then ask them to mix to form teams, ideally made up of a range of different roles. 4. 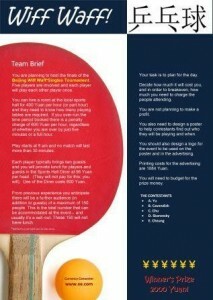 Once the teams are formed (and not every role may be represented within every team) issue Team Briefs. 5. After 15 minutes issue resources and allow a further 20 minutes for working on the task. Observe them in action and make notes for the debrief in terms of how they worked as a team and how the different roles worked (or otherwise). 6. After the allotted time stop the teams. 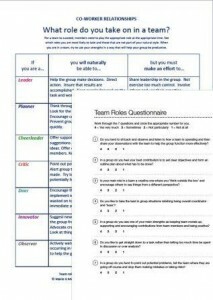 Ask for results from each team in terms of the answers to the task. 7. Lead a general debrief on how the teams operated and how useful the roles were in achieving the task. 8. Consolidate the learning by linking the idea of team roles to the workplace and how improvements might be made in terms of behaviours and attitudes. Full instructions, debrief notes and worked calculations all supplied in the Trainer’s Notes.